Protecting your business from a fire is crucial! A fire can be terribly disastrous for any business owner. A fire can cause injury, sometimes death in occupants of the building. Even some of the smallest of fires can result in high costs to repair the damage. No matter the size of your company, a fire can cause destruction in your business. Reducing the risk of fire is extremely important. Here are five easy and highly effective ways to protect your business from being destroyed in a sudden fire. An essential step in avoiding a fire is to prevent fire hazards from inhabiting your office building. Being a proactive business owner is critical for your office building to prevent a fire. A significant step towards preventing fire in an office building is to eliminate the clutter. Having extra materials within the office space is fuel for a fire. Instead, opt to reduce the amount of paper you keep on your desk and around the office in general. Business owners also want to ensure that employees don’t burn candles or use space heaters by prohibiting these fire hazards from entering the office space. If a fire should happen in your business, having a properly installed fire alarm is imperative. 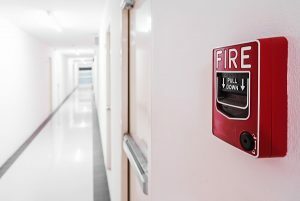 Having a fire solution system like a fire alarm alerting employees and other occupants of a fire danger is necessary so that all employees can evacuate safely and quickly. By notifying employees quickly, injuries resulting from a fire are significantly reduced. Fire extinguishers need to be installed correctly in every single business. Having all your fire extinguishers properly tagged and inspected is a necessary component of fire protection. Another excellent idea for business owners is to invest in training for all employees about the proper way to use a fire extinguisher and the protocol for what to do in a fire emergency situation. This entry was posted on Friday, September 22nd, 2017 at 8:22 am. Both comments and pings are currently closed.